This free calorie intake chart is more than just a weight loss tool for tracking your calorie intake for weight loss. The Microsoft excel version allows you to track your calorie intake but is also a weight loss tracker and an exercise tracker. This is three weight loss tools combined into one. You can download and save to your computer and print off all or any of the pages you want or just update electronically on your computer. These files are a great way to track your calories to ensure you are creating a calorie deficit for weight loss. Be sure to read the details below the download section to see what each file offers so you can select the one that will work best for you. To download the file you want, just right mouse click on the link below and select "save as" to save to your computer. The spreadsheet is a zip file. Once you have saved to your computer, you will have to unzip the file in order to use it. The PDF version will open in a new window/tab. Simply select save as to save to your computer. Click here to see a sample screen shot of the Excel version of this weight loss tool. This section explains how to use the calorie intake chart. 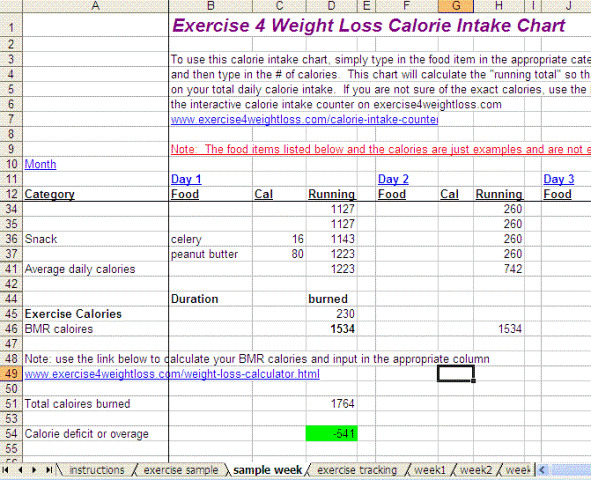 The Excel version of this calorie intake chart file has up to four weeks for tracking. After the four weeks, simply save the file. Then clear the data and start tracking the next four weeks. The Excel version also has daily charts which track your daily calorie intake, daily calories burned and your calorie deficit. Charts are a great visual for you to see your progress. There is also a chart showing your weight loss progress. The reason the Excel chart has only four weeks for tracking is that it uses your basal metabolic rate in the calories burned calculation. As you lose weight and build muscle, your BMR will change; therefore you want to update the file with your current BMR. I suggest you update your BMR at least every four weeks, which is why this file is designed for only 4 weeks. If you don’t have Microsoft Excel but would like compatible software to Microsoft tools, then be sure to visit the weight loss tools page for a link to Open Office. This software is totally free. I have verified that this file will open up with this software. The PDF version of this chart allows you to save to your computer and then print it off for recording your calories. It is a simple version and allows for tracking calories only. If you also want to track your exercise calories with a PDF version, then be sure to check out the exercise calorie counter available on this site. Get your free journal and track your progress. Tracking your weight loss can be a great motivational tool. Use this free online tool to find the nutritional values in the foods you eat. If you are counting carbs, calories or even fats, this tool can help you stay within your allowance. Before you buy the next diet pill advertised as a burn fat quick solution, check out this article to see what natural methods you can do to shed some fat.